To make the roux: In a large stockpot (about 10 quarts), heat the vegetable oil over medium-high heat. When the oil is hot, gradually add the flour, whisking continuously, and cook, stirring and adjusting the heat as necessary to keep it from burning until the roux is a dark mahogany color (about 25 to 35 minutes). Be careful: If the roux burns, you will have to start all over again. Add the okra and bring the gumbo to a boil. Cook for 5 minutes. Reduce the heat to maintain a slow simmer and cook, uncovered, for 30 minutes, or until the okra has lost its bright-green color and is cooked down like the other vegetables. If the gumbo gets too thick, add a little water. If it is too thin, continue to simmer it, uncovered. Gumbo is always better the day after it has been cooked; although I’ve never had a complaint when I served it the day I made it. 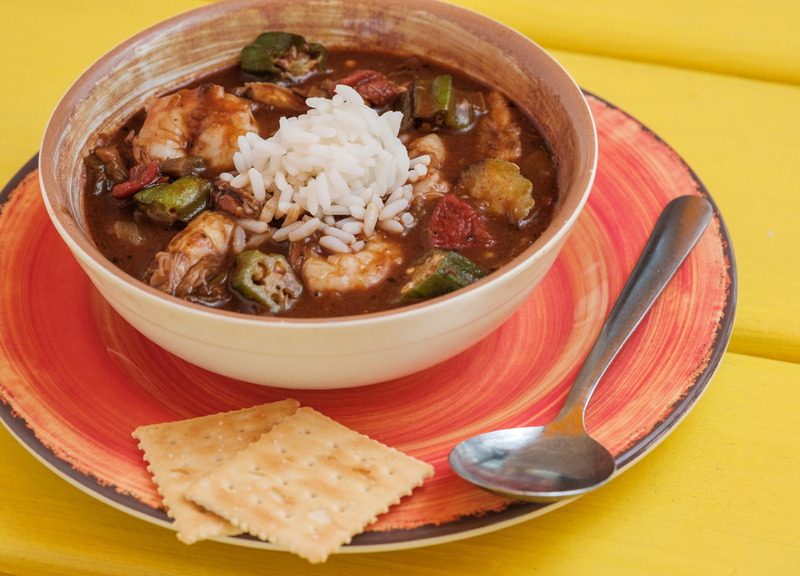 At this point, you can cool the gumbo. Turn off the heat and let it sit for about 30 minutes. Then place the pot, uncovered, in an empty sink. Fill the sink with cold water and ice around the stockpot (try not to get any in the stockpot itself). Stir every 15 minutes to facilitate cooling. When completely cool, refrigerate the gumbo in the stockpot, uncovered.